Mixed Martial Arts (MMA) is a new craze in Myanmar after Myanmar born Aung La N Sang won the World Middle Weight Championship belt in 2017 and proudly displayed Myanmar flag in the ring. Popularly known as "Burmese Python", 6 feet 1 Kachin ethnic fighter was born in Myitkyina and has a hugh following in Myanmar. Back in the glorious days of several decades ago, Burma was the powerhouse of South East Asia in sports, with the football team that made the country proud. Somehow, the country took the wrong turn, and the glory and the pride of the land of the fast and the strong had faded away along the dusty road of economic and political struggles. In 2013, Myanmar hosted the 27th South East Asia Games after the long gap of 44 years since the last hosting in 1969. As a host, Myanmar had a decent showing with the second position in medal tallies after Thailand. 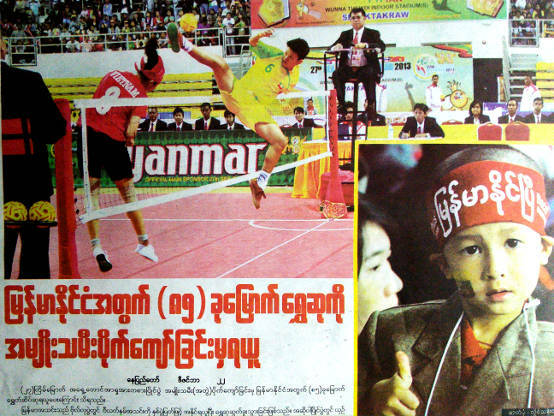 Sports in Burmese is called ah3-ga1-za3. Alternatively, you can also say ga1-za3-pweare3 or ah3-ga1-za3 pweare3. We have seen this word pweare3 before in lesson 26. It generally refers to a festival where people have fun and watch shows and entertainment complete with roadside stalls selling food, snacks, souvenirs and various merchandizes-- kind of like a carnival. When it comes to sports, the word pweare3 is equivalent of the word "match" or "event" as in "sporting event" in English. For example, bau2-lone3 means a football (soccer ball), and bau2-lone3 pweare3 means a football match. Football (soccer) is, by far, the most popular sport in Myanmar. Nowadays, Burmese football fans seem to hero-worship Manchester United team in particular, and the names of several local football clubs end with "United", such as "Zwekabin United", "Yangon United", and so on. To bring up the level of Myanmar football back to international standards, Myanmar local football clubs hire several foreign coaches and players. Bau2-lone3 pweare3 thwa3 kji1 ja1 meare2 -- We will go watch a football match. beare2 dau1 leare3 -- When? Do you see the pattern? Generally, the word "strike" (yite) is used if you hold something in the hand such as tennis racket or golf club and strike an object. You use the word "play" (ga1-za3) for the rest with the exception of kicking and tossing the ball around using your foot. Let's review different types "let's"
Back in lesson 3, we have seen the word "ja1-zo1", and "ja1-meare2" which both refer to the word "Let's". Earlier in this lesson, we used the phrase "thwa3 kji1 ja1 meare2", which means "Let's go watch..."
In lesson 19, the word "yah1-oun2" is used, which also means "Let's". Also in lesson 19, we use the word "ja1 yah1-oun2", which is the plural form of the word "yah1-oun2". The word "ja1" in "ja1 yah1-oun2" indicates that the activity will take place for more than one person. In lesson 21, we used yet an another word "ba2-zo1" to express the word "Let's". What's the difference among different types of "Let's" in Burmese? When you use the words "ja1 zo1" or "ja1 meare2" you are taking the role of leadership position to suggest something to someone or to a small group of people. The word "ja1 meare2" is almost certain that some event WILL take place without objections. The word "ba2 zo1" has more determination and courage in it, and is used to make a proposal to provoke and incite a larger audience. The words "yah1-oun2" or "ja1 yah1-oun2" don't have the ordering tone used by the leader of the pack as in: "I want to play. How about you?" More phrases with "ja1 yah1-oun2"
Let's learn more of the word "ja1-meare2"
We will build up the complexity of the phrase using the word "ja1 meare2" explained above. "Ga1-za3" means "to play". So, "ga1-za3 ja1 meare2" means "Let's play." Remember, "ja1 meare2" is a plural word to indicate that some event WILL take place. When the phrase does not contain the pronoun "they", "we", or the names of the parties involved such as in the phrase "ga1-za3 ja1 meare2", by default, it refers to "us". In another words, "We will play." ga1-za3 ja1 meare2 -- (We) will play; let's play. How can I say Myanmar will play with Malaysia? myan2-ma2 neare1 ma1-lay3-sha3 ga1-za3 ja1 meare2 -- Myanmar will play with Malaysia. de2 nya1 ba1-ma2 neare1 Ma1-lay3-sha3 neare1 ga1-za3 ja1 meare2 -- Tonight, Myanmar will play with Malaysia. No, it's not a typo error. "With" is repeated in the above sentence. The literary form of the colloquial word neare1 used as a conjunction in the phrase is hnin1. ba1-ma2 refers to Burma. This is also the name of the majority Burmese ethnic people. In the original National Anthem after the independence, the word ba1-ma2 pyi2 was used. It was later changed to myan2-ma2-pyi2 to reflect the inclusion of more than 100 ethnic people. My translation of Myanmar into English is "the land of the fast and the strong". So, who won the game? Colloquially speaking, people will usually ask "who" won the game instead of "which team" won the game. beare2-thu2 nine2 thwa3 leare3 -- Who won the game? The word thwa3 is the verb "to go". In the above phrase, it is used as a particle and modifies an another verb nine2 (to win) into the past tense "won". It's kind of like asking: "How did it go?" Refer to lesson 14 for more examples. ba1-ma2 shone3 thwa3 deare2 -- Myanmar team has lost the game. tha1-yay2 kja1 thwa3 deare2 -- It was a draw. Take note of the omission of the first person "I" in the above phrases. If someone asks what you are doing at this moment, it's more natural and shorter to answer without the use of "I". By the way, hun3 pfone3 is saying the word "hand phone" with a Burmese accent. What's a "hand phone"? It is the translation of "Shou ji" in Mandarin Chinese into English where "shou" refers to the hand and "ji" is the machine. That's what a cellphone or mobile phone is called in places like Singapore. hun3 pfone3 in Myanmar used to be unbelievably expensive costing over US500, and it was a status symbol to own one. When the price has come down to around 100,000 kyats (over 100 USD) for the SIM Card alone without the cost of the phone (hand set), it has become a dream comes true for many Myanmar people. In early 2013, government has started to distribute limited amount of SIM cards in lucky draws with the low, low price of 5,000 Kyat [less than US$5]. As of 2014, it is possible to own a Chinese-made cellphone with SIM card for less than 40,000 kyat. The top-up card comes in the amount of 5,000 kyat or 10,000 kyat. You will be surprised to see some trishaw drivers showing off their hun3 pfone3 that was unimaginable just a year earlier. As of 2015, there are three major service providers: MPT, Ooredoo, and Telenor providing mobile services. It is now possible for ordinary people to access Internet over the mobile devices. Oh, yeah, for many of Myanmar People, their first phone is a smartphone with SIM card that costs 1,500 Kyat in it. de2 nay1 de2 hma2 yut ja1 ya1-oun2 -- Let's stop here for today!